The penultimate event in the Cork Orienteering Club Autumn League took place at the majestic setting of James' Fort Kinsale on Tuesday evening. Orienteering is a sport which allows us all to be active outdoors and evenings and locations such as that of Tuesday’s event remind us just how fortunate we are to enjoy this great sport There really aren't enough superlatives to describe how amazing James’ Fort and its surrounds looked on the night. With clear skies and a fresh evening the 68 participants in attendance got to enjoy challenging orienteering in this wonderful arena. Anyone who thought to pack a fishing rod with their O-gear could have caught themselves a fine supper. With the tide in the fish could be seen and heard in the surrounding waters. Those who visited the beach after their run might have witnesses a battle of a different kind taking place offshore as a seal chased mackerel that were themselves chasing sprat. Furthermore, Tuesday evening also happened to coincide with the date of a Supermoon. This is an unofficial term for a Full Moon that occurs when the Moon is at its closest to Earth. So to complete a fabulous evening, as the Sun was setting the Supermoon was rising producing an optical illusion called the "Moon Illusion" which makes the Moon 'look' bigger when it is low down, just above the horizon. If you missed this remarkable event because you were travelling home from the event then take a look at the James’ Fort photo album on the Gallery page. The 1:4000 James’ Fort map fits on a A5 page so with 17 controls on the Advanced course it was inevitable that the course legs would be criss-crossing each other. Some competitors found it tricky to decipher the course which added to the challenge on the day. In particular, on the Advanced course several folk’s confused control 8 and 1. Luckily those who cross checked the control codes realised the error in the ways. For such a compact area the planner managed to design one of the longest courses we've had at James’ Fort for some time. The course legs offered plenty of route choice with several options available on many legs include going round the fort, through the fort, up the fort and of course through the infamous tunnels. Furthermore, many of the control sites offered competitors stunning vistas for the surrounding areas. Scaling the bare rock to control 5 was rewarded with a view of the magnificent Charles Fort while control 10 at the water’s edge provided a vista of Kinsale. Controls 12 and 15 on the earthen bastions offered marvellous seascapes and aspects of the river Bandon. These outlooks could no doubt distract even the most focused orienteer. On the Advanced course Conrad Daly didn't succumb to these scenic distractions and took the event win. He obviously had no difficulty reading the map or traversing the hill as he completed the course in an impressive time of 22:26. Gerald Duffy was runner-up on the night having punched all 17 controls in a time of 23:35. Brian Corbett bagged the final podium spot completing the course in a time of 24:37. Things were very competitive in the Ladies race on Tuesday evening with Elaine Sheridan bagging the title of fastest lady on the night. She completed the course in a time of 30:46. Less than a minute behind Elaine was Trishia O’Mahony who finished runner-up on the night with a time of 31:52. There was a close contest for third place with Deirdre Duncan just narrowly piping Una Buckley for the honour. Deirdre finished the testing course in a time of 32:07. On the Explorer course Oisin O’Sullivan set a blistering pace and managed to complete the 1.5km course in a time of eleven minutes and 47 seconds and took the event win. There was a very close battle for the honour of runner-up on the Explorer course. Ben Latimer clinched second place with a mere 16 seconds to spare over third place finisher Andrew Murphy. Ben punched all ten controls in a time of 14:22 while Andrew had a time of 14:38. Well done to everyone who participated on the night. Full individual results with split times are available here. Thanks to John Chandler for planning fantastic courses and to Jim O’Donovan for taking care of starts. Thanks also to Bobby O’Connor for assisting with control collection. 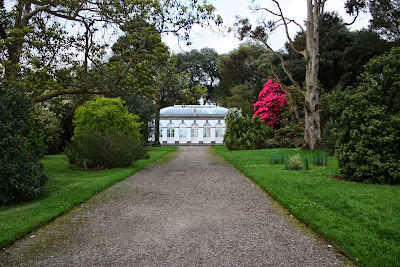 The final event in this year’s Autumn League will see us return to Fota House and Gardens. The idyllic parkland terrain around the house and gardens will be your last opportunity to enjoy evening orienteering for some time. So don’t miss out. Further location information and directions are available here.